My flashback started with a little piece about making butter from scratch on The Splendid Table. The writer mentioned how important the quality of the cream was, and I was reminded of my childhood – stepping out to the front porch every morning to find the latest delivery from the milkman sitting in a little wire basket. If I got up really early, I’d hear him coming up the driveway, the bottles clinking together like a chime. Food is such a stimulus to memory. Listening to her talk was like stepping into a time machine of my own. I remembered my sisters fighting to get the solid little lump of cream that was at the top of every bottle of milk, but even more, a time when my grandmother would make butter to spread over hot sweet corn or pat into pie crust. I loved to sit at the big oak table in the ranch house kitchen, three black metal ceiling fans buzzing lazily overhead, as I watched her rushing to get it finished before the heat of the day made it impossible. I never saw grandmother use much in the way of appliances – she said they got in the way of love, and that’s what cooking was all about. However, she did have an old stand mixer that we used for butter. She’d lift me up on the kitchen stool and I’d peer into the bowl, knowing a cold glass of real buttermilk would soon be coming my way. Grandmother, 1966. 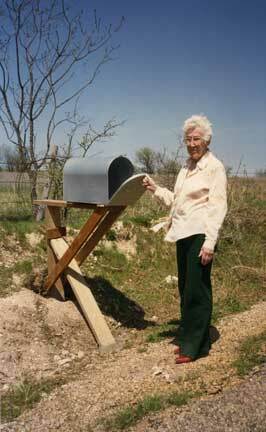 No one was going to knock over her mailbox! Not having neighbors anywhere near, grandmother was pretty self-sufficient. Once she taught me to knead the butter, she turned the job over to me, and I’d take the big bowl out to the back stoop with a bucket of water and work away. It never seemed like it took very long; she’d keep me in rapt attention with stories of early days on the ranch, and soon I’d forget everything that was going on around me. One day she excused herself for a moment and without warning, came back with a shotgun and blew the head off of a rattlesnake that had come out of the old steps next to me. We had to start a new batch of butter, as I’d flung the bowl twenty feet in my fright, but first, she sat and laughed until she could no longer catch her breath. It turned out to be the biggest rattler found in that part of Texas, and a picture of her holding the remains in one hand and the shotgun in the other ended up in the paper a few days later. Listening to my mother, I thought back to that day; to the sound the old windmill made pulling up water for the cattle troughs, and the clouds of grasshoppers that rose up as we drove through the fields in the Jeep, honking the horn to call in the cattle. It occurred to me that any butter I could make these days could never be as good as back then – not only would it not have grandmother’s love, but the cream wouldn’t come from the cows just down the road. Still, I put it in the back of my mind as something to try in the future. Fate intervened. A few weeks later, Nancy Rommelmann called. “I”, she said, “made butter last night from scratch!” I asked lots of questions; what kind of cream they had used, what speed the mixer was on… all of the things I knew were important. I wasn’t happy with her answers (’cause I’m critical of everything), so I made a deal. In a few weeks, I would come over and we would make butter together. I would bring the ingredients, she’d provide gin for sustenance, and we’d make an afternoon of it. Thankfully she said ok, and also agreed to be my “butter model”. Last week we got together, made lots of butter, had a few drinks, and worked out the kinks. This is a great project to do with the kids, but after umpteen batches this winter, I haven’t found any adults who don’t enjoy it either. The equipment is simple: a good mixer (you’ll need the power), a few wooden spoons, a spatula, and if you have an aversion to buttery fingers, a pair of kitchen gloves. The only ingredient in butter is cream and sometimes salt, but get the best you can find. I use Strauss Family cream. It still comes in the heavy glass bottles with a plug of solid cream at the top, and in my informal tests, tastes better than the others I’ve found around town. Again, the better the cream, the better your butter. You’ll find the terroir of the farm also influences the taste. A stand mixer. You can try with a hand mixer, but I’d be surprised if it will be powerful enough. 2 pints whipping cream – room temperature. Don’t use ultra-pasteurized cream or cream with fillers. If I’m salting the butter, I use Fleur de Sel, which gives crunchy explosive bites. 2 pints will make about 14 ounces of butter, and just less than 2 cups of buttermilk. 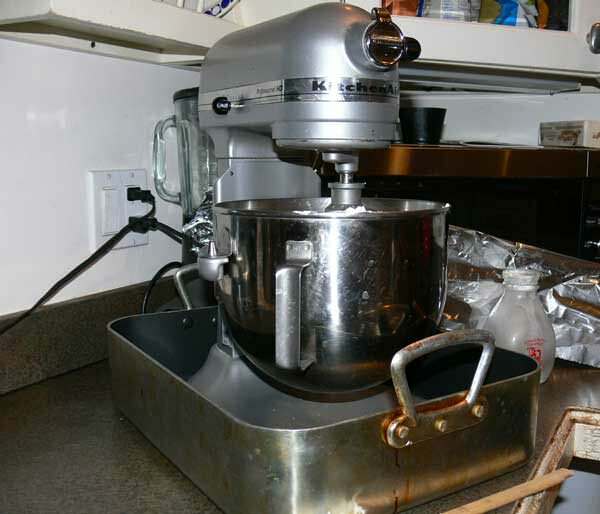 Put your mixer bowl on the stand, install the whisk attachment and add the cream. I use two pints per batch. Two tricks that will make your life easier: I stand the entire mixer in a shallow baking pan to catch any overflow. Trust me, there will be overflow. Next, take aluminum foil or plastic wrap, and make a collar around the bowl. This will also help prevent splashing. You’ve been warned. Start the mixer slowly so it doesn’t splash, and work up to medium speed. Too fast and your cream will be a bit grainy. Pour a glass of wine, and have a conversation; I recommend a nice Riesling (or some gin and my tonic). Soon the cream will come to soft peaks. Think about fresh spring strawberries with whipped cream and Kirsch, but fight the urge. Stop the mixer for a moment and scrape the sides of the bowl. Turn it back on to medium speed. In a short time, the cream begins to form stiff peaks. Marvel at nature, and pour another glass of wine. Time will pass; usually about 20 minutes. Keep an eye on the bowl; everything happens quickly, and this is when you’ll find out how effective your preparations were. The cream will begin to get a bit lumpy and take on a pale yellow color. I always think how good it would be spread on carrot cake. In a short time, a thin liquid will appear on the bottom and sides of the bowl. This is the buttermilk. Slow down the mixer a bit. In just a few seconds more, the cream suddenly seizes. 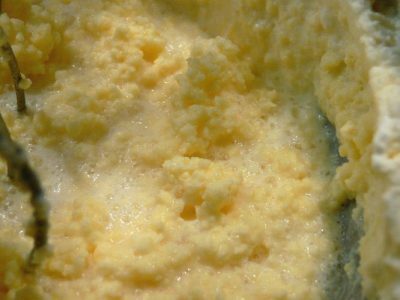 Yellow blobs of butter form and buttermilk pours out, and unless you prepared properly, all over the kitchen. The first time I made it I thought, “How messy could it be?” I had to clean the counters, the floor, and pull the refrigerator out to get the remains that had run between it and the cabinets. Stop the mixer, and pour the buttermilk into a bowl – it’s not sour like store-bought buttermilk, and you may actually find yourself drinking it or using it in cooking. It’s great for making biscuits, and the butter itself is great with them – a match made in heaven. I usually restart the mixer and blend it a little bit longer, to help force out any more milk. Now comes the fun part. Stop the machine. Wash your hands for a good long time (or cheat and put on gloves), and then scrape the butter off the whisk. Put the bowl of butter into your sink, and start running cold water into it. Knead it just like you would bread dough. Fold it over on itself; squeeze it between your fingers. You can do this part with two wooden spoons, but you want love in this butter, right? The water in the bowl will become cloudy; this is the remaining buttermilk. Discard it, and continue kneading the butter and refreshing the cold water. You want to continue until the water runs as clean as possible; otherwise, the leftover milk can turn rancid and severely limit the storage life of your butter. Dump the water, and knead out any remaining. Take a little of that fresh creamy butter and spread it on a piece of crusty bread. Sprinkle with a little salt. Have a sip of wine. Marvel at the smoothness of your hands. At this point, you can call it finished, but that’s what separates the cooks from the chefs (and why this is better than the Mason jar method). 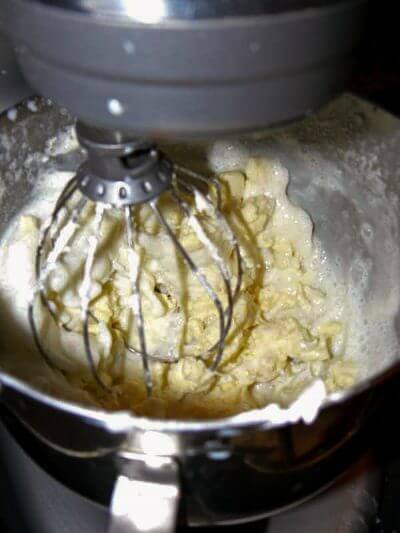 Throw the butter back into the mixer and whisk it for a short time at a higher speed. This will beat in some air and make it lighter. Add salt if you want, but be very careful – it takes quite a bit less than you might expect. I use a scant teaspoon per pound. Once it is chilled, the salt flavor becomes stronger; but if you accidentally over-salt it, you will find it mellows after a few days in the refrigerator. This is the time you can also add other ingredients, such as finely minced garlic or herbs. Transfer to an airtight container and refrigerate. Mine lasts at least a week, but only if I’m on vacation; otherwise it’s eaten in a couple of days. I have been told that salting the butter makes it last a bit longer. Once you have done it a few times, making butter is easy; something you can do while chatting with friends. It tastes so much better than the store-bought stuff, you’ll have a hard time using anything else. Frankly, I’m surprised a few restaurants around town haven’t tried it. There has to be an enterprising pastry chef somewhere who wants to impress the chef! When you make food with your kids and friends, you make lasting memories. My grandmother lived to be over 100 years old and left me with a lifetime of cooking memories. Take the time to do the same with your family. You might turn out a chef, or a great-grandmother (you can read more about her in this post). I also have a post about making mayonnaise here. Wow, thanks for this, the memory, the description of your technique and thanks for recommending Strauss Family cream. Two Fat Ladies did a great, somewhat scary, butter-making scene in Wales. It’s Season 3, The Lock Keepers. Thank you! Truth be told, I accidentally published this piece before I was ready, but it’s good enough. A great piece of food writing dude! It evoked memories of my grandmother teaching my mother (her daughter-in-law) how to make noodles and another memory of eating rattlesnake served in my grade school cafeteria! I loved this story Dude! Of course, pretty much everything is best when made from scratch so no suprise that butter would be too, but the infusion of your chilhood memories into the story was just great. There are some great artisinal butters out there as well that, although probably not as great as the homemade stuff, pack quite a punch. My current favorite is Vermont cultured butter with seasalt. Mmmmm…. the unsalted is good too. Cultured butterr is a whole different animal and is the considered by many Europeans to be the only way to make butter. They simply add a culture to the creamm before making the butter and let it sit a while to develop more flavor. Just a tidbit for ya. Great piece! Thank you – I am going to try this as soon as I can. A couple of questions: 1) where you do buy Strauss Family Cream? and 2) about how much butter does a 2-pint batch yield? Thanks again. New Seasons carries Strauss dairy products. Thanks! Zupan’s and Whole Foods (i think) also carry the cream. It’s makes about 3 sticks of butter, maybe a bit more. I’m going to make some tonight, so will weigh it when I’m finished and let you know. Yes, the Whole Foods Market chain. I know you can get the milk throughout the west coast (or you could the last time I checked), but really, any good cream will work. I prefer using the best stuff I can find – food is only as good as its weakest ingredient. Nice story! If you want to up the ante, make creme fraiche first and then turn that into butter. The butter was fantastic. I made some homemade biscuits immediately afterwards and we ate them hot, with fresh salted butter. Yum. NB: The Dude is a true gentleman for not mentioning I was halfway schnockered in the photo. Mmmm, biscuits. But were they buttermilk biscuits? Ummm, I thought FD made that pretty clear in the photo with his suggestion for the placement of the two butter cups in addition to his passing reference to gin. And, FD, be careful about using a flash with a window in the background if you intend on maintaining your secret identity. Wow, salmonfly… it never occurred to me my reflection showed up there. I’ve smeared it. Thanks! I’m usually very careful about such things. Great story, thank you so much for sharing this! IMO, this is why your site is so wonderful. And you were right, it has a happy ending! Nancy, thanks for participating and sharing your kitchen for the experiments! Really really great stuff! I can’t thank you enough for this wonderful, wonderful post. Not only was it a great bit of writing about your memories, but the instructions are quite clear and inspirational. 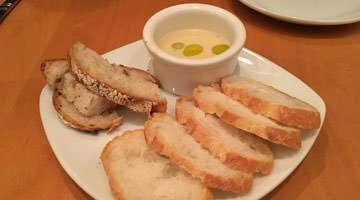 I’ve been trying to figure out how to get pastured butter into my home which has proven a bit difficult as I’ve only found local pastured milk and cream. I never thought to use the cream to make my own butter! I’ll be going out tomorrow and trying my first batch on home-baked bread tomorrow! We culture the cream first (and I agree with you, Strauss is the best if you can’t get raw, pastured cream). After it cultures for a day we proceed as you do, saving that lovely, tangy buttermilk. Then we grind flour, mix it with the fresh buttermilk, and let it soak overnight to make hot buttermilk biscuits the next day. To be eaten, of course, with thick smears of the cultured butter; it’s heaven. For anyone with kids, this is a great experience – and I highly suggest you read Little House on the Prairie too – there’s at least four or five pages devoted to butter making, down to how they colored it with a little bit of grated carrot in the winter to make it pretty. In my earlier comment – I meant “Little House in the Big Woods” for the butter making description. But as a side note, “Farmer Boy” is fantastic for all the different foods that were put up by preserving, or jerking, or canning, etc. throughout the year, and mouth-watering descriptions of the lavish dinners and suppers they served. Enjoyed the story very much, especially when you talked about your Grandma. I’d love to read more personal articles like this. It brought back fond memories of my Texas Mema, who was just as deadly to snakes…..except she used a garden hoe to chop off their heads! I’ve been using the shimmy & shake method to make butter in a jar since my young nephew taught it to me after he learned it in school. I look forward to trying your way soon. If you get a chance, try the Straus Creamery Vanilla Bean Ice Cream-it’s heavenly but addictive, so consider yourself forewarned. Their yogurt is also superb. This is the first time I’ve been to your site(came via the angry chicken), and I will be back. This was a wonderful story, and plan on making this with my children over spring break–I think we’ll have a blast! This was funny! I remember coming home from school and finding pints of cream in the fridge for something my mom was making. Several (read most) times i would throw the cream into a mason jar with a lid and shake it until i had butter. This was something i had learned to do in Girl Scouts and i LOVED IT! Of course i was a creative child and i would make special molded creatures out of my new butter for the dinner table. I can only imagine how awful they must have looked with all my finger prints in them. More often then not, we had company coming that night and that cream was supposed to be whipped for pie. Good Times! This is absolutly amazing and filled my heart with such joy! I love happy fond family memories like this. Thank you so much I can not wait to make some butter! Are you using pasturized or non pasturized cream? If it’s non, where on earth do you buy that? I thought they’d pretty much banned the use of non pasturized dairy products. I use organic pasteurized cream. We can’t get non-pasteurized here (easily). Do not use Ultra-pasteurized. I’ve had your post bookmarked for a while and tonight I made the butter. Ooh boy. I never want store-bought butter again with its dull, flavorless taste. The fresh butter was perfect for my butter bell, where it will stay soft and spreadable. And we happened to have store buttermilk on hand and did a taste test with our butter by-product — no contest between the two. The home version was mild and creamy, the store-bought was acrid and sour. Thanks for posting this! thank you, thank you! i just tried this and w/ homemade artisan bread, it’s ambrosia. Wow! After reading this beautiful story, and enjoying the house-made goats milk butter at Alinea last week, I’m ready to give it a try. Would the same process apply if I sub goats milk for heavy cream? Is the fat content comparable? Any advice would be much appreciated. Thanks! Thank you so much for letting us enjoy your memory of butter making with your gram.